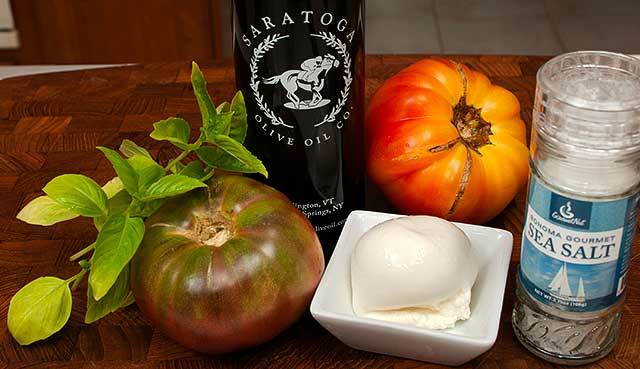 The demise of the small family farms has greatly reduced the availability of heirloom tomatoes. 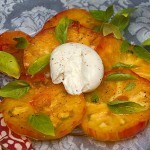 For this tomato caprese salad recipe, if you are unable to find heirloom tomatoes, homegrown tomatoes will be fine. Burrata cheese is a mozzarella cheese exterior filled with mozzarella curd and heavy cream. It is readily available by Bel Gioioso Cheese, Inc. This recipe is courtesy of Extra Virgin, on the Cooking Channel. Slice your tomatoes into ½ inch thick slices. Season generously with kosher salt. Arrange the tomatoes on a plate. 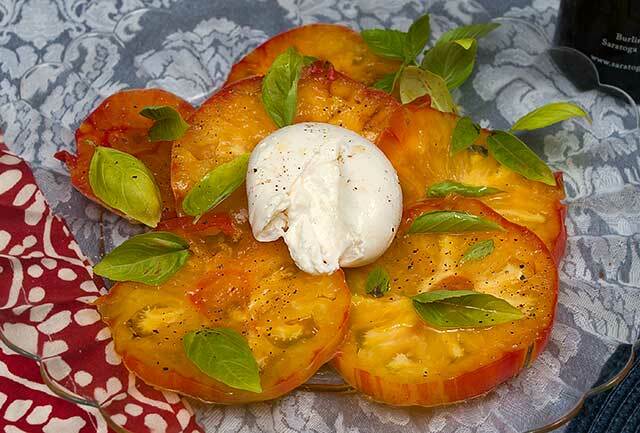 Place a burrata ball or two on top of the tomatoes. Garnish with torn fresh basil and a drizzle of extra virgin olive oil. In Blue Eggs and Yellow Tomatoes, Jeanne Kelley makes a homemade pesto sauce; and she drizzles that over the sliced tomatoes and the burrata cheese. 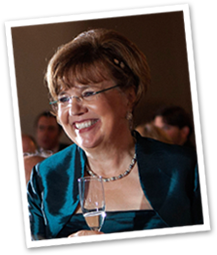 She garnishes with pine nuts. Courtesy of Gabriele Corcos and Debi Mazar of Extra Virgin. Variation: In Blue Eggs and Yellow Tomatoes, Jeanne Kelley makes a homemade pesto sauce; and she drizzles that over the sliced tomatoes and the burrata cheese. She garnishes with pine nuts.